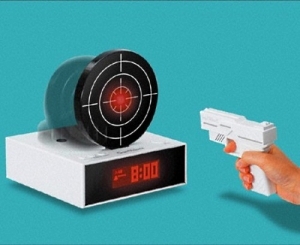 The Gun O’Clock is an alarm clock that requires a shot to hit the bullseye to shut it up. The clock was created to try solve the problem of people not getting out of bed. By creating something with a loud noise that doesn’t have a regular snooze button, the aim is to force you to get of bed and accomplish a task. The Gun O’Clock certainly achieves that as high accuracy is needed just as you wake to keep the thing quiet. Check out the rather funky animation of how it is expected to work. Would I be able to do this in the morning (if it was more than 6 inches from my bed)? Probably not. Cool idea, but the person who made this wakes up faster than I do apparently.